Star Wars fans don't really care how long you have to travel through Hyperspace, or how fast -just as long as you get there first. As a result the warp vs. Hyperspace rules I've created are extremely simple. If you know a ships maximum Warp capability subtract that from 10, divide by two and round to the nearest standard Hyperspace multiplier. This is the maximum speed for that ship, Warp is variable and the ship can travel at any Multiplier slower to a maximum of times 10. Ships should not be allowed to travel at maximum for more than 12 hours unless otherwise specified. Normal cruising speed would be a multiplier of 4 or 3, maximum cruising speed 3 or 2. 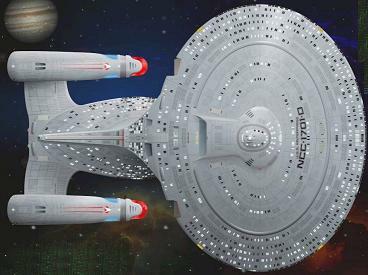 Example, the Enterprise D can reach speeds of up to Warp 9.3 for up to 12 hours. (10 -9.3)/2 = .35, which rounds up to a Multiplier of .5 (Same as the Millennium Falcon). It's normal cruising speed is Warp 5, equivalent to a Multiplier of 3. It's maximum cruising speed is Warp 1m, or Multiplier of 2. Warp 10 and a Multiplier of 0 are roughly the same as an Infinite Improbability Drive, infinite speed, so don't even think about it. Warp Drive is held by similar constraints as Hyperdrive. Neither can allow a ship to come to close to stellar objects while traveling without risking the destruction of said ship. Both require a Navigational Computer to assist in plotting a course away from such objects. It is extremely dangerous, though possible, to use either within a solar system. Use the same modifiers for pilot rolls that are already used, very little adaptation is necessary. The advantage to using a ship with Warp Drive over a ship with Hyperdrive is that since a ship in Warp does not leave real space it is possible to scan, carry on communications, and such while traveling. Ships in Hyperspace can't do this. By the same token, ships at Warp can be scanned while at warp -so may be easier prey for anyone who looks for them. Shields for Star Trek ships are significantly different than shields for Star wars ships. First, the shields are not divided between fire arcs, there is only one shield for the entire ship. Second, their shield strength is rather high when you take that into account. However, shields do not protect against ion weapons, and Trek ships do not have ion weapons themselves, so can't use them against other ships. Ships in Star Trek react differently in one important way when taking damage. No matter where the ship is hit, the bridge stations blow up. Circuit breakers are lost technology in the Trek universe apparently. 6 Destroyed. The ship immediately disintegrates in a ball of flame. Everybody is dead! * For detailed descriptions of each station's position and function see the ST: TNG technical manual.